Our reflectometers feature most accurate single beam reflectance measurements by height and tilt adjustment Accurate height and tilt adjustment of samples using ACT functionality of sample and high light conductance of optical layout allow repeatable measurements of n and k, measurements on rough surfaces as well as thickness measurements of very thin films. (up to 200 x 200 mm2) Second objective lens SpectraRay/3 software PC equipped with an x‑y mapping stage and mapping software, objective lens for a second spot size, and a video camera. The comprehensive, recipe oriented FTPadv EXPERT software for our reflectometers RM 1000 / 2000 includes measurement set-up, data acquisition, modeling, fitting, and reporting. An extensive database Extensive data base for: Dielectrics on semiconductors Epitaxial films on semiconductors Metallic films on semiconductors Organic films on semicoductors Films on metallic substrates Films on transparent substrates of predefined customer proven and ready to use applications is already built in. The AutoModel option allows for automatic selection of sample model from a spectra library. Based on SENTECH expertise in spectroscopic ellipsometry, a large materials library and the variety of dispersion models allow the analysis of nearly all materials and films by our spectroscopic reflectometers. The data library can easily be updated with new optical data by the operator. SENTECH supports its customers with the measurement of new materials with unknown optical properties by spectroscopic ellipsometry. The comprehensive, recipe oriented FTPadv EXPERT software for RM 1000 / 2000 includes measurement set-up, data acquisition, modeling, fitting, and reporting. An extensive database Extensive data base for: Dielectrics on semiconductors Epitaxial films on semiconductors Metallic films on semiconductors Organic films on semicoductors Films on metallic substrates Films on transparent substrates of predefined customer proven and ready to use applications is already built in. The AutoModel option allows for automatic selection of sample model from a spectra library. 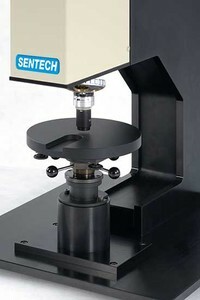 Based on SENTECH expertise in spectroscopic ellipsometry, a large materials library and the variety of dispersion models allow the analysis of nearly all materials and films. The data library can easily be updated with new optical data by the operator. SENTECH supports its customers with the measurement of new materials with unknown optical properties by spectroscopic ellipsometry.